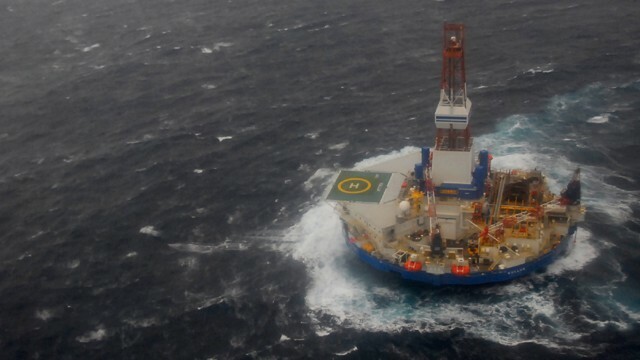 An oil drilling rig operated by Royal Dutch Shell ran aground on a pristine wildlife-rich island in Alaska on Monday. This came after a series of technological failures in gale force winds and high seas—driving home serious concerns of WWF about drilling in the Arctic. The grounding of the vessel is the last of a series of incidents for Shell after the company received permission from the U.S. government in August to conduct exploratory offshore drilling in Alaska’s Chukchi and Beaufort seas. Over the last four months, the two rigs and tug boat used in the operation have experienced engine failure, fire and broken tow lines. Shell’s response vessel for this mission was deemed ill-prepared for response and Shell was fined for a series of illegal discharges of toxic fluid from one of its drilling rigs. Shell also was fined for violating air permit regulations related to the drilling operation. WWF is identifying the most important and sensitive places for Alaska’s wildlife, which often are places of significance—culturally, economically and environmentally—to indigenous people and communities. We also consider areas that are particularly resilient to climate change. After identifying these areas, we aim to ensure they are off limits for industrial development, including oil and gas drilling. WWF is advocating for science-based and transparent decision-making processes about when drilling is allowed. Based on the assessment of engineers, biologists and many oil and gas industry officials, WWF believes there is not adequate technology or infrastructure to respond to and contain spills in the sea ice environment. WWF promotes restricting drilling periods and other standards to minimize environmental impacts. We want to ensure that there is the capacity to respond to a drilling disaster. Currently, there is not adequate equipment, people, or training in Alaska to respond to a spill. Because many marine mammals depend on sound to survive, WWF wants to see better regulations in place that help minimize the amount of drilling-related noise. Join WWF in telling the federal government to keep the Arctic pristine and not jeopardize our natural heritage and local communities over risky oil exploration.